In their monthly survey update on US phone usage, comScore reported that by the end of April 74.6 million people in the U.S. owned smartphones. In the same period a year ago only 48.1 million did. The percent of smartphone users out of total phone users has reached 32%. 2.1 million or 474k people/week became smartphone users during April. 62% of smartphones in use in the US are either Android or iOS. The sum a year ago was 37%. There are about 20 million iPhone users and 27 million Android users in the US today. A year ago there were 12 and 6 million respectively. 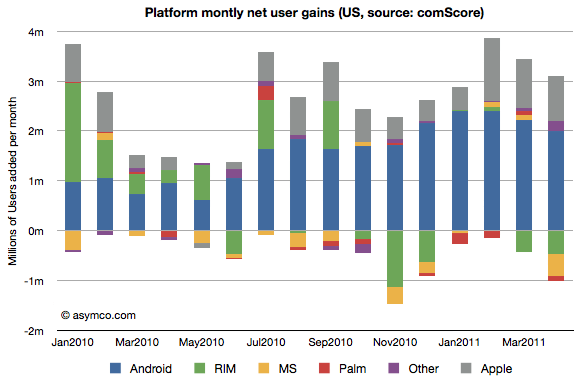 RIM’s US user base peaked at 22 million in Sept 2010. It is now 19 million and dropping. Usage of Microsoft mobile operating systems in the US is in steady decline dropping from 7 to 5 million users in one year. During April 475,000 people abandoned their Blackberries. Android and iOS gained 3 million users in April. One million switched from other smartphones and 2 million switched from non-smartphones. 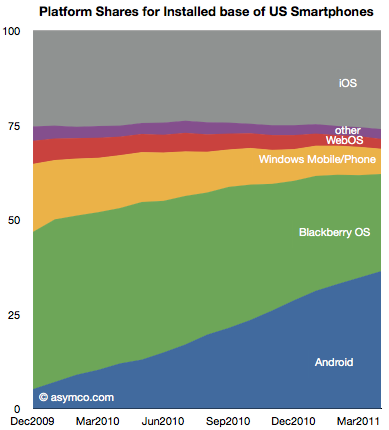 The following chart shows the evolution of installed base share of platforms among users of smartphones in the US. The impressive share gains for Android are apparently at the expense of RIM and Microsoft. Over the period shown, Android gained 25 million users while RIM gained only about 2.8 million. Although perhaps comforting to see some growth overall, the situation for RIM is more grim than that. During the first half of the period (December 2009 to August 2010) RIM had gained 4.6 million users. During the second half (Sept 2010 to April 2011) RIM lost 1.8 million users. Note how RIM (green bars) went from being a consistent net usage gainer to a consistent net usage loser during this 16 month period. In addition, note how Microsoft’s platforms (yellow bars) have had a very poor showing with very small gains during four months and moderate losses during the others. The losses in usage even increased after the release of Windows Phone late last year suggesting no traction whatsoever for Windows Phone. The other point to be made is that if we assume smartphone users remain smartphone users, then those platform losses are gains by other platforms. In other words, the areas less than zero in the chart above represent smartphone “churn” or switching between platforms (As a percent of all smartphone users that number represents 1.35%.) That number is far lower than the total smartphone gains, so it’s safe to say that most of the iOS and Android gains were at the expense of feature phones rather than other smartphones. And since iOS share is consistent (and supplies are constrained), few if any Android gains are at the expense of iOS. There are many interesting patterns to observe in the data, but I think the most evocative is the erosion of Blackberry usage. If the Blackberry peaked, and a follower platform not yet in sight, the question is how long will RIM survive? 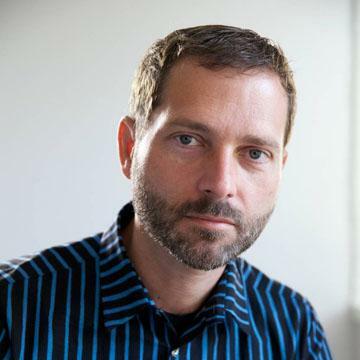 ‹ Previous Post Does the phone market forgive failure?